Want the desktop web browsing experience on your smart phone? You are going to want to cop skyfire then! I’ve had it for almost a year now in beta form. It allows you to watch videos, its blazing fast, and it is like surfing the web on your regular computer. Oh, did I mention that it is free? 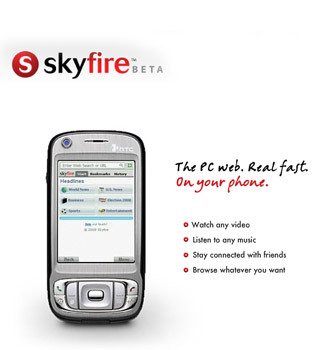 Yes, so go head and put the mobile IE and Opera mobile to shame, and enjoy skyfire. What are you waiting for, start freestyle browing now! www.skyfire.com.